Karl reMarks: Design your own London skyline. 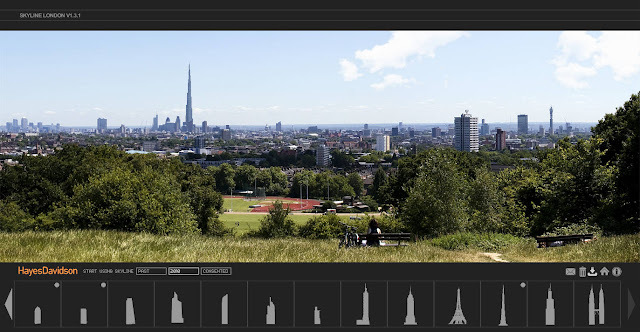 A great tool has been launched by Hayes Davidson one of the leading visualisation firms in the UK, it lets you design your own London skyline. It does have some limitations because you can only use existing designs, but still great fun. So what did I decide to do with it? Of course, put the Burj Dubai in London. That immediately shows you how modest the buidlings that are considered tall in London are by comparison. I tried lpacing it within the City of London (above) and Canary Wharf (Below) and I think it looks great in both cases. I guess we need about 3 in London. What don't you try doing your own? I totally disagree about the aesthetics of the Burj in particular and tall buildings in general. I only like them in Japanese anime, and then when it's something that makes BladeRunner look meek. But really no no not good. Let alone great. re: aesthetics of towers: Fine, but do you agree with the stereotyping of Arabs and the dismissive attitude towards Dubai's aspirations? Whether you like the tower or not is immaterial, the point is that the critique in western media wasn't really about the Burj itself but what it represents. You can't separate that from the prevailing anxiety and pessimism. Even on a personal level, the fact that you see towers in a certain way is a reflection of how you've absorbed this previaling discourse to a certain extent. The role of critique is to expose those trends not to reproduce them. But then again I am an old fashioned Marxist, so what do I know? Jouj says: I don't agree with the stereotyping of Arabs of course, nor about the dismissive attitude towards Dubai's aspirations - although I personally find Dubai's aspirations insane. It's funny you found this post, as I had just collected videos for a class, to talk about how the media talks about a crisis, and the market (the uncontrollable beast). Yes there is a definite sense of schadenfreude in them. But about discourse... You can say that if you want. The prevailing discourse as far as I could was Dubai is the modern miracle, until it buckled under a financial crash threat last year. I had been against THAT discourse. All I know is that a few years back there were more buildings coming up in Dubai than there were people coming (ok exaggeration - but definitely more than people could sensibly afford - but that's what most friends of mine complained about). I thought then that it was insane, and I still think so now. The palms and world islands I find absurd as well, these ecological disasters of visible-from-the-stars billions costing urban planning projects rub me the wrong way. As well as the amount of energy used in keeping a freezer alive in the heat, to be able to ski and have a real chimney within it. It's a hyperreal city and I am having trouble enough dealing with the real/surreal. It might be the way of the world to place oneself on the scene, then I don't like the way of the world. Money and projects and Guinness Book of World record heights, yaani are as convincing to me as the Biggest Hommos and Tabbouleh in claiming legitimiacy in the Levant. Donc, NOT. The discourse about Dubai was never the prevailing one, there were western journalists and some Arabs as well saying that it will all end in a disaster long before the financial crash which, keep in mind, didn't start from Dubai but eventually affected it because it's connected to the global financial system. I know it's hard not to judge Dubai by its more outlandish creations, but would you judge New York the same way on the basis of the Chrysler building or the Empire state? These are some of the visible monuments but a city cannot be reduced to them. Look behind that and you will see a city that's clearly got more depth. Maybe you and I wouldn't live there, but millions of others do and they love it. You can't judge their choices moralistically. On ecological disasters, think again. The reclaimed islands actually improved biodiversity not the contrary, because it was part of the intention of the project from the beginning. And the amount of energy spent only looks scary because we live in times in which the energy question has been problematised and in the wrong way. It used to me that the more energy you use the more civilised you are. ANd objectively, it still is. But again we look at these issues with the dark-tinted glasses of today's pessimistic world. jouj says: I particularly dislike the Empire State building (inside its spaces are awful). And New York is hell on earth in many ways. And now so many buildings and shops are left vacant because of the crisis, that it also annoys me. I never said that the crisis began in Dubai mind you. I am not judging people's choices moralistically, if they decide to live in Dubai. I admit to not being able to live there myself, as I require more streets to walk on, than highways to drive (I am not a happy driver). I'll look into the eco-diversity thing again, but I am still skeptical. ok, since you asked, I will work my way to Marx through Zizek, because you talked about the 'real'. Zizek talks about this idea that we're surrounded by things like beer without alcohol, decaf coffee, cream without fat, etc. So we're experiencing a crisis in our relationship with what is real. It's a very seductive idea of describing the current condition, except that it's not quite true. Zizek is making the assumption, which you also made in relationship to Dubai, that there is something more 'authentic' about traditional beer and butter and older cities. But you and Zizek (flattering to be put in the same phrase, ha?) are correlating past experience with reality, when in fact everything around us as human beings is or was created by mankind at some point. This doesn't make it more 'real' just because it's been around for a while, it's only severed its relationship historically to the conditions under which it's made and assumes an a priori nature to us. After all, there is nothing 'natural' about making butter from milk or brewing beer, these are just uses that mankind invented. Let's jump to Marx now, who described very carefully the process by which humanity transforms nature into socially useful products through labour. This process which is essential to civilisation is crucial, without it society will languish in a primitive state. The more technologically developed that process the more a society is developed, not only materially but it can also afford the time to indulge in everything we associate with culture, music, literature etc. The conditions to creating art are enhanced when we don't all have to toil to meet the basic demands of life. So the process of exploiting nature is very important to human wellbeing. In that sense, Dubai is but one manifestation of that process. It's about aggressively altering the 'natural' geography into an active urban environment. It might not look like a European city or the city as we know it, but that doesn't mean it's inherently inferior, it's just produced in a different time and in a different way. You can pass an aesthetic judgement on Dubai, but you're only expressing your preference based on what you are more familiar (and comfortable) with. But essentially the aggressive processes taking place in Dubai are progressive in nature, although much like all production under capitalism they tend to produce their own inequalities. But that's entirely separate to the question of whether Dubai is ecologically sound or not. So, to me as a Marxist, Dubai is to be celebrated because it goes against the grain of today's conservative assumptions about the relationship between man/nature and development in general. It still produces inequalities, but those inequalities are part of how capitalism operates, not something specific to Dubai as some claim. If we put our aesthetic biases aside, Dubai seems like a very interesting proposition. That was a bit longer than I intended...but happy to disagree anyway.